From: Battle of Baltimore, March 13, 2012. 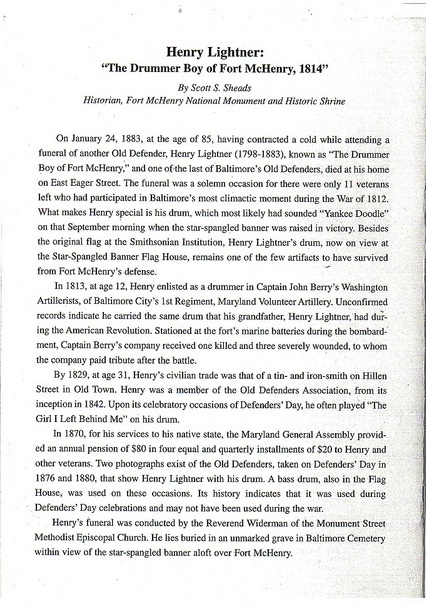 A 16-year-old drummer boy named Henry Lightner was stationed at Fort McHenry during the Battle of Baltimore on the morning of September 11, 1814. The threat of impending battle had soldiers and citizens on edge. Many attempted to fortify their positions, while others fled the city hoping to escape the wrath of the British Empire. 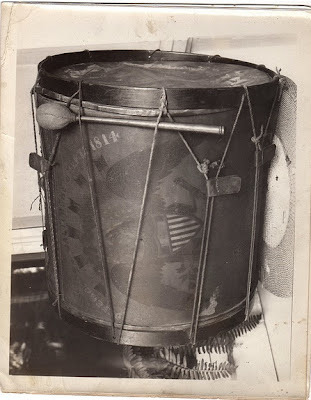 The young drummer boy remained at his position practicing the songs he was instructed to play when his company engaged in battle. The soft sound of his drum carried through the tense air of the battleground, rat-a-tat-tat rat-a-tat-tat. The first sound of battle echoed across the Port of Baltimore via four pound cannon fired from the British fleet stationed in the harbor. The projectile collided with the mud soaked earth and rolled across the ground to the feet of the drummer boy. The gentle rat-a-tat-tat is silenced and the boy ran to alert his commanding officer, Captain John Berry of Washington Artillery of the First Regiment, Maryland Volunteer Artillery. 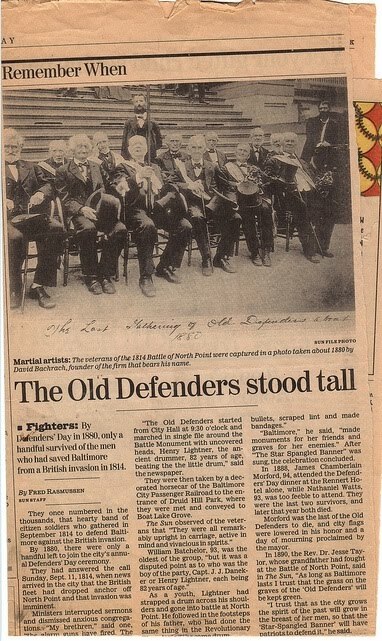 Following the War of 1812, Henry Lightner became what was later known as The Old Defenders of Baltimore, a group of veterans who marched in an annual parade until his death in 1883. 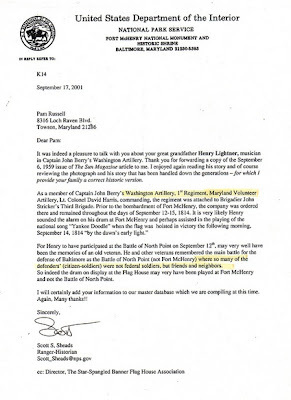 Today, Henry Lightner is buried in an inappropriately marked for veterans of the War of 1812. 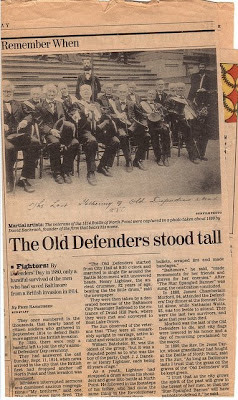 Some of his living descendants are attempting to have the grave properly marked in time for the bicentennial of the war. The grave marking will be an invitational event of descendents and invited guests; an estimation of the guest list is 80 or more people. 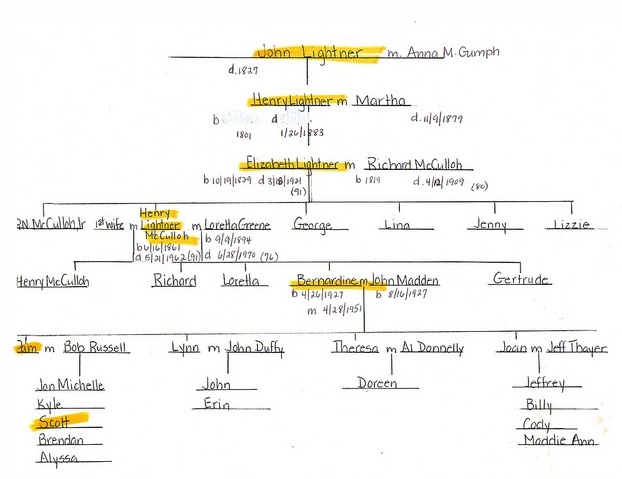 Henry Lightner had 14 children at least one of whom; Elizabeth Lightner had six children of her own. Russell’s grandfather donated the drum to the Flag House Museum in September, 1959 for the purpose of preserving an artifact of the conflict, primarily because his grandchildren often played with it and threatened its safety. 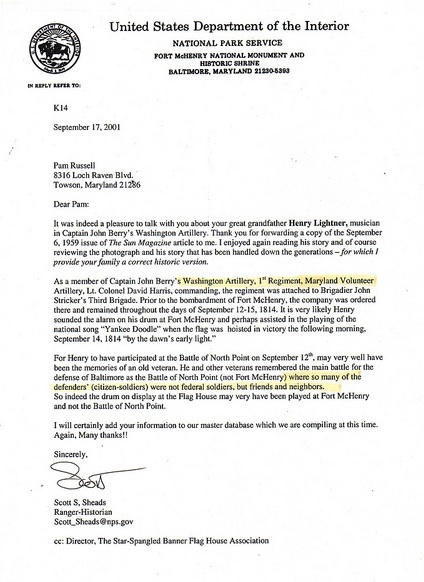 Russell visited the Star Spangled Banner Flag House Museum in Baltimore City on Saturday March 3, to submit a deposit to rent the Orientation Theater building for the reception following the grave marking ceremony. 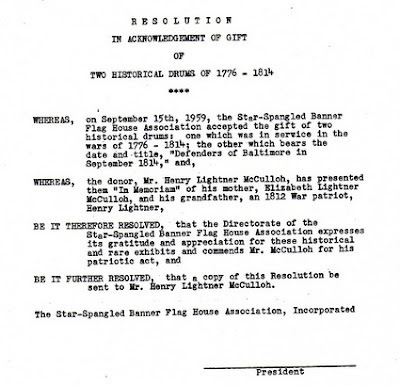 The Flag House Museum is the former home of Mary Pickersgill, who was commissioned to sew a 42 foot long flag to fly over Fort McHenry for the British to see and know that it was a military base. 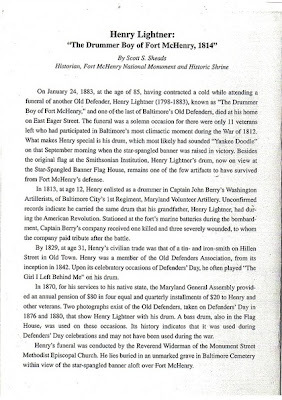 Currently, the Flag House contains several artifacts relevant to the war including the drum of Henry Lightner in the museum’s lobby. Russell met with another descendent of Henry Lightner for lunch later that same day. Elaine Sauer, descendent from Anne Lightner (Elizabeth’s younger sister) had become avidly involved in the grave marking ceremony with Russell. 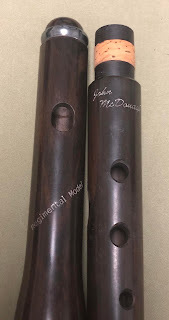 Sauer met Russell through another distant relative of Lightner’s. 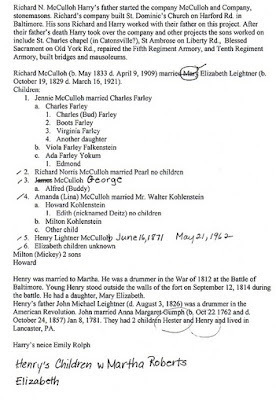 Sauer had already been conducting research on her family history and was researching how to provide a grave marking for Lightner around the same time as Russell. The women had lunch at a nearby diner going over a checklist of responsibilities to complete before the ceremony. The table at the booth was occupied by the dishes of their entrees, basket of various condiments, and two glasses. In the few spots of the table not covered by their meal were the amenities of their meeting, a folded piece of paper, a notepad to jot down ideas and comments and a few blue and black pens. At the time of the lunch meeting, Russell had gathered several speakers for the grave marking ceremony. The speaker’s who have agreed to attend the ceremony include Tim Smith, a local historian and another relative of Henry Lightner, Ranger Scott Sheads of the Fort McHenry Historical Society, and several representatives from the Daughters of the American Revolution and Daughters of the war of 1812. One of the most important and hardest tasks which were discussed was the financial cost of the event as a whole. The marker for the grave to acknowledge Henry Lightner is a veteran is free, but the installation is estimates to cost $90. Maintenance for the head stone year round is another $200. This didn’t account for the cost of the ceremony at the Flag House Museum for $180 plus the cost of food at the event, invitations, clean up, etc. Russell and Sauer discussed collecting donations from other interested descendents across the country to fund the ceremony.